As of last year the word “meme” has been added to the Merriam Webster dictionary alongside “emoji” and other, so called, tech words. Surprisingly enough, the word made its first appearance way back in 1976, in Richard Dawkins’ book, The Selfish Gene. He used it to explain the spread of ideas and all sorts of cultural phenomena, like melodies, catchphrases, fashion, and even the technology of building arches. The word itself is in fact the shortened form of mimeme, which itself stems from the Ancient Greek word for imitating / miming. But in more recent years, as more and more people got interconnected, the spread of ideas and cultural phenomena exploded like never before, and so did Internet memes. Dawkins characterized this particular branch of memes as deliberately altered by human creativity, instead of by random change or Darwinian selection, “thus hijacking of the original idea.” An Internet meme can stay the same or evolve over time, and can take on many forms, like an image, a video, a website, a word or phrase, a combination of these, or even a random behavior. We’ll be taking a look at 10 of the best memes out there, and see how they got to where they are in the public consciousness. We do apologize in advance if by any chance we won’t include your favorite one in here, though something tells us you’ll survive. There’s arguably no one on the internet more annoying, and an overall worse friend than Scumbag Steve. As he’s walking in through the door, and wearing that backward flat-brimmed baseball cap and a faux fur–collared coat, he has that “Yeah, we’re friends and all, but I’m more important than you” look on his face. He’s that one “friend” who we all had to grow up with. That guy who always borrowed stuff and never returned it. And even when he did, it was broken. Well, in reality Steve’s real name is Blake Boston, and he’s a pretty nice guy. At the time this picture was taken, it was 2006 and he was 16 years old. His mom was taking some photography classes and asked him to pose for some shots. 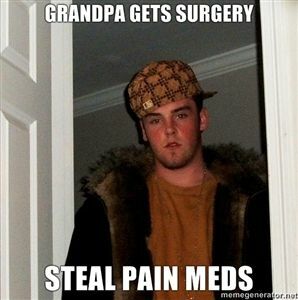 “Scumbag Steve” was born in 2011 when the photo, which was on Blake’s MySpace page, became an internet meme. It is estimated that in five years, over 412,000 unique meme variations of Scumbag Steve have been created on the internet. “Invite Steve to party … iPod stolen” or “Contributes a dollar … Eats half a pizza,” are just some of them. Even his hat took a life of its own as it was cropped and placed on other people’s heads to express their “douchiness.” Since Steve became so famous, he even got a girlfriend: Scumbag Stacy, his female version. A checkered sweater vest, a dorky haircut, an innocent reddish face and goofy smile complete with braces, are all you need to make the perfect accident prone kid out there. That’s Bad Luck Brian for you. He’s the universal symbol for never being able to win, and the meme is used to describe a wide variety of embarrassing, awkward or tragic situations someone could be in. His real name though is Kyle Craven and he’s from Cuyahoga Falls, Ohio. As the jokester of his class, Kyle took that picture in 2006 when he was 17, as an annual yearbook photo. He wanted to go for the goofy look so he bought that vest from a thrift store, rubbed his face to redden it, and made that silly smile on purpose. The picture unfortunately didn’t make it into the yearbook, due to his principal, who suspected he made it awful on purpose. 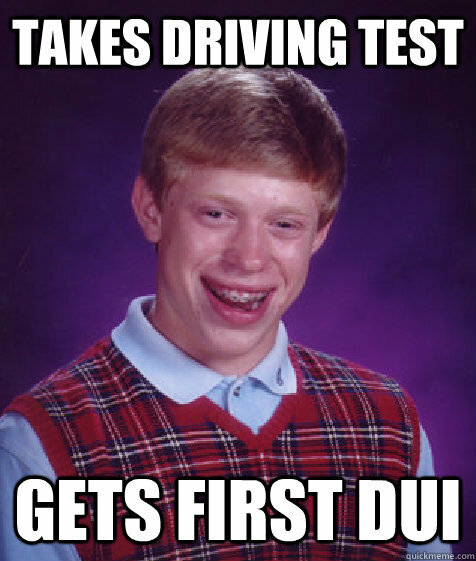 However on January 2012, Ian Davies, a long-time friend of Kyle, posted it on Reddit with the caption, “Takes driving test… gets first DUI,” but only received 5 upvotes. That same day another macro with a new caption “Tries to stealthily fart in class…sh**s,” reached the front page of the subreddit and got over 3,300 upvotes. With a google search prevalence topping in that same year, Bad Luck Brian has had more than 650,000 unique captions made from it. Back in 2009, an internet photo fad took off under the name of the “Lying Down Game.” It was a mass-participatory activity in which people would lay themselves face down in unique or outlandish public spaces, with their hands to the side, and sharing that photo on the internet. Its origins go back even further to 2006 when two UK guys, Gary Clarkson and Christian Langdon created a Facebook group which slowly gathered momentum, growing steadily in followers from about 1,500 users to about 99,000 followers and 19,000+ image submissions. In September 2009 the craze got its first real media coverage when seven hospital emergency staff members were suspended for playing the game all over the hospital while on their night shift. But as things began to die down, the game made a sudden reappearance in early 2011 under the name of Planking. It began in Australia, when rugby player David “Wolfman” Williams started using it as a signature move during rugby games, every time he scored a try. The term “planking” was reportedly coined in 2008 by Paul Carran, a New Zealander living in Sydney. Nevertheless, the internet meme returned with a vengeance, gaining over 130,000 fans on its Facebook page within the first week. It got crazy media coverage with all sorts of Hollywood stars like Katy Perry, Justin Bieber, Demi Moore, Chris Brown and Rosario Dawson endorsing it. But as people got more and more “inventive” the first accidents began to happen. At one point planking became a controversial topic in the media when a 20-year-old man from Australia plunged to his death from a seven-story building. Rapper Xzibit reportedly called it racist, an “Anti-planking law” was issued in the Philippines, and it even got its own “Global Planking Day” on May 25. 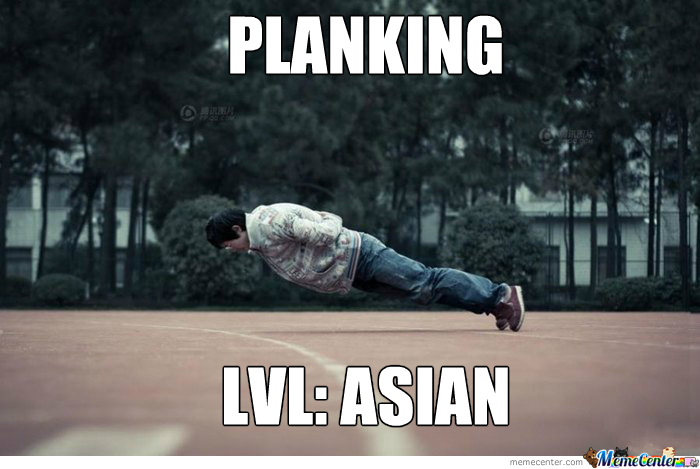 Without a doubt planking was the most successful activity-type meme ever, spawning numerous others after it. Milking, Owling, Teapotting, Horsemaning, Batmaning, Tebowing and Springing are just some of the later variations of Planking. But for the time being at least, this “sacred art” of posing has toned down. “Is this real life?” Not that many videos go viral on YouTube, but “David after Dentist” is definitely one that did. In May 2008 David DeVore took his 7-year-old son, David Jr., to the dentist for an appointment. And since his mom couldn’t be there, his dad decided to film him before and after the procedure, in order to show her later. But after the surgery was completed and both Davids got into the car, David Jr. began asking some really deep questions, like “Is this real life,” “Why is this happening to me,” and “Is this going to be forever?” It was a fun video for all the family and friends to watch, no doubt. On January 30, 2009 DeVore uploaded it to YouTube. In just three days the video had a whopping 3 million views, and soon “David after Dentist” appeared on a variety of news sites and tech blogs like The Wall Street Journal, Videogum, Laughing Squid, Buzzfeed, and Gigaom. Within a month DeVore became a YouTube partner, since it was the second most watched video of 2009 after Britain’s Got Talent competitor Susan Boyle. In 2010 Time magazine classified it as the third best YouTube video of all-time. In one year’s time, in 2010, the video itself generated about $100,000 and another $50,000 from licensing and merchandise. Today, some 7 years later, “David after Dentist” stands at more than 133.5 million views. Among the most used memes to have ever come out of a TV show is the Ancient Aliens guy, Giorgio A. Tsoukalos. Of course there are the Winter is Coming or Annoyed Picard, but without a doubt Ancient Aliens is the funniest and the most frequently used. Ancient Aliens is a TV series which has been running on the History Channel since 2009, and tends to explain mysterious or puzzling events from our past as the direct result of aliens visiting Earth and helping out early humans. Tsoukalos’ hairstyle may have helped a lot in making this particular meme go viral, which it did in 2010 via 4chan. When it comes to cartoon-based memes, Futurama Fry / Not Sure If is the most commonly used internet meme out there with close to 1.5 million unique variations of it being created. The meme show Fry from Futurama in a still captured during Season 2, Episode 11 “The Lesser of Two Evils.” Its use is to show someone in deep contemplation about a particular subject, “Not sure if…, or just…” unable to tell the difference between two choices. One of its earliest, if not actually the first, variant of this meme was “Not sure if trolling, or just stupid,” which appeared around 2011, though the still was first used as an I See What You Did There derivative. Futurama’s host channel, Comedy Central, aired several commercials featuring Not Sure If memes, prior to season seven’s debut. Among the original ones, they also used various popular versions of the phrase found online. At the end of the opening sequence of that first episode of the season, the meme makes an appearance using the phrase “Not sure if new episode, or just rerun of episode I watched drunk.” That same month, June 2012, was when both “fry meme” and “futurama meme” had the largest volume of searches on Google, ever. It seems like it was only yesterday that people were dumping buckets full of ice-cold water onto their heads and filming themselves doing it. But believe it or not, it’s been two years since that craze actually happened. In and of itself the Ice Bucket Challenge was a dare game in which each participant had to do the dare and nominate three others to do the same in 24 hours, or donate $100 for research and treatment of Amyotrophic lateral sclerosis (ALS). A similar game, the Cold Water Challenge, appeared just several months before this one, and it’s quite possible to have been its inspiration. Nevertheless, the Ice Bucket Challenge’s origins are still largely a mystery and lasted for about two to two and a half months, peaking in August 2014. Among the first to do the challenge and capture it on film, was professional motocross racer Jeremy McGrath on June 22. He then challenged professional golfer Rickie Fowler, NASCAR race driver Jimmie Johnson, and none other than Vanilla Ice to do the same, or pay the 100 bucks. By July 14 the fad gathered enough momentum for journalist Matt Lauer to do the challenge on The Today Show, nominating Martha Stewart. It then spread like wildfire, reaching millions. Among the many that did the challenge were Tom Cruise, Jimmy Fallon, James Franco, Hugh Jackman, Charlie Sheen, 50 Cent, Bon Jovi, Lady Gaga, J-Lo, Katy Perry, Justin Timberlake, Mark Zuckerberg, Oprah, Bill Gates, Tiger Woods and George W. Bush. In the end the ALS Association raised roughly $100 million throughout the summer of 2014, as compared to $3 million the year before. For a brief moment in time the world was divided in two: the Blue and Black against the Gold and White. It all started with a Tumblr post in which viewers were asked to identify the color of a dress. This seemingly inconspicuous question sparked a world-wide debate in February 2015. In just 48 hours from being published, the post gained over 400,000 notes, and BuzzFeed posted a poll asking readers to decide on the color combination. In just 6 hours, the poll received more than 16 million votes with over two thirds going towards White and Gold. That same day the site published a second post revealing the true colors of the dress after discovering it on a United Kingdom-based online retailer. It was listed as a “Royal-Blue Lace Detail Bodycon Dress,” and it clearly showed its Black and Blue colors. Internet “old-timers” reading this article will definitely know what these are, and their own sense of nostalgia is sure to fill them in right about now. A long-forgotten “art-form,” some may say that Demotivational Posters, or Demotivators, are the precursors of all present-day memes. They usually consist of a picture, centered and bordered in black with an all-caps title and a tagline written in smaller font. Back in 1985, a company by the name of Successories had, among various other products, motivational posters commonly found in corporate offices. You know the ones, since they still make an appearance of Facebook walls from time to time. Then in 1998, Despair Inc. brought its own line of posters, similar in design but with an underlying text designed to be depressing instead of uplifting. Over the following years 4chan – the meme powerhouse – made them more and more popular to the point where people started making their own, often times using twisted humor. As time went on, the internet slowly renounced these Demotivators in favor of a new generation of memes, but their cynical jokes remained more or less the same, even though their design did not. Who’s the most badass guy out there, you may ask? We all know the answer to that question, so we shouldn’t even bother asking. 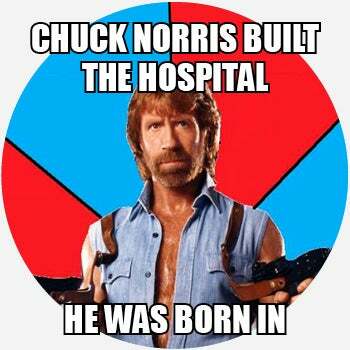 But the real question here is just how did Chuck Norris get to become the legend he is today? It might come as a shock to many, but the answer actually lies with Vin Diesel. After his movie, The Pacifier, appeared on the big screen in 2005, people began writing facts about Vin Diesel on the SomethingAwful forums. Ian Spector, an American humorist and web developer, decided to make a website where people could post their own ideas. On its first day, the site received over 20,000 hits. Since 2005, it has become almost taboo to say anything bad about the man-legend. He’s 76 year old now, and if anything bad is to ever happen to him, the internet will probably have to be shut down for several weeks, in order to avoid implosion. But don’t worry. Did you know that Chuck Norris has the heart of a little boy? He keeps it in a wooden box underneath his bed.